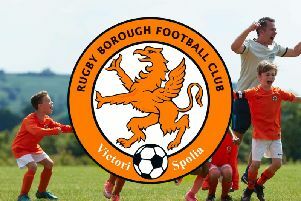 A new senior team called Rugby Borough Football Club will be playing at Kilsby Lane next season. It has been formed in partnership with Rugby Town Juniors, Rugby Town Girls and Ladies FC and the Strachan Football Foundation and will be led by two experienced non- League managers Darran Tank and Ady Fuller. Tank, who has played at a high level of non-League football, will be in charge, with Fuller taking on the role of head coach. The club have applied to join the Midland Football League - in which Butlin Road side Rugby Town are likely to be playing in the Premier Division after their relegation from the Northern Premier League last week. A ground grading has been completed and passed and the application will be ratified at he the Midland Football League AGM in June. The new Borough side is one of 13 additional teams announced by Rugby Town Junior Football Club, ready to don the orange and white strip for the 2017/18 season. Club Chairman Liam Coulter said: “We are delighted that Darran and Ady have taken this project on. “Our development plan and the local Playing Pitch Strategy states that there is room for a senior team in the area. “We also need to bridge the gap for our talented players who go and play elsewhere. We can now accommodate them within our set up. “It is also the final piece of the jigsaw allowing boys and girls to join this club and see out their careers within it. Two other significant appointments to the senior set up are Steve Turner (Senior Football Secretary) and Brian Dainty (Media and Press Officer), overseeing the club’s administration and media coverage. Running along side the seniors will be a Rugby Town Veterans team, an additional Under 16 team and ten additional junior sides including three in the Midland Junior Premier League, making the club one of the biggest in the country. The ladies will also be expanding with two additional girls’ teams and a Ladies’ Reserve team.